MECLABS is dedicated to using the Web as a laboratory to gain an understanding of the factors that influence human choice. MECLABS develops robust partnerships with leading businesses and universities to conduct real-world research that continuously validates and updates our library of insights. From the beginning, Flint McGlaughlin, founder of what eventually came to be known as MECLABS, had an interest in and passion for the philosophy of human choice, experimental design and the cognitive psychology of conversion. With the increasing growth and adoption of the World Wide Web, McGlaughlin identified a living laboratory in the 1990s through which he could conduct experiments in these fields and better understand human choice. 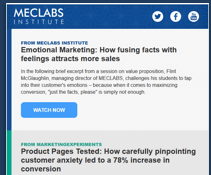 In 2000, McGlaughlin began to formalize this online research by founding MECLABS, to conduct real-world behavioral experimentation, and MarketingExperiments, to publish the discoveries from this research to marketers and business leaders around the world. In 2001, MECLABS began forming direct Research Partnerships throughout Europe and North America to conduct research with companies facing real challenges and actual situations where customers must make a choice as opposed to hypothetical situations, such as focus groups or surveys. Work with the Transforming Business Center at Cambridge University began in 2007 when Flint McGlaughlin accepted an academic position as the Director of Enterprise Research. Transforming Business is a multi-disciplinary research and development project led by Dr. Peter Heslam that focuses on enterprise solutions to poverty. MECLABS acquired InTouch that same year to help expand its lead generation and management research, as well as MarketingSherpa, to establish an external publishing and research subsidiary to find and report on case studies conducted by brand-side marketers using any agency or marketing solution. In this way, MECLABS is able to identify best practices through MarketingSherpa, and then test them directly with Research Partners through MECLABS to discover what really works for each Research Partner’s unique prospects and product offerings. In 2008 MECLABS filed for and in 2012 received a patent (U.S. patent number 8,155,995) for a repeatable methodology for offer-response optimization. MECLABS uses this patented Test Protocol system to bring discipline to the behavioral testing it conducts with Research Partners. 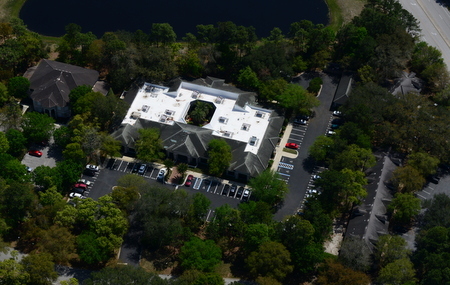 Today, the MECLABS Institute has a central campus in Jacksonville, Florida. Marketers, business leaders and academics like Dr. Theo Theoharis of Harvard University, author Michael J. Lanning, and Dr. Wouter van Rossum of the University of Twente from around the country frequently visit the Jacksonville campus to discuss current business challenges, explore findings of recent research and bring insights from multiple disciplines into the lab. MECLABS has continued to grow its Research Partnerships with both emerging online businesses and established global enterprises. The Methodology features a uniform test protocol and series of heuristics our data scientists use in experimentation. Only experiments that have undergone multiple validity checks by our Data Sciences Group feature the MECLABS Institute seal. Rather than depend on universities for grant money, MECLABS partners with key companies to conduct experimentation. Your organization can work side-by-side with research analysts to learn what your customers really want through a Research Partnership. Our research institute not only publishes our own findings but shares these discoveries with media outlets as well. If you enjoy a fast-paced environment where the only limit to your growth is your own capabilities, please check out our open positions. Information on how to engage with the team at MECLABS. MECLABS headquarters moved to Marsh Landing Parkway, Jacksonville Beach, Fla.
MECLABS established headquarters at 60 Ocean Blvd in Atlantic Beach, Fla. Published first MarketingExperiments Research Report — "Pay Search Engines Tested: 5 pay search engines are compared in an 8-Month Study"
InTouch is established at 2150 Third Street in White Bear Lake, Minn.